Where they occur, underground rodents are the bane of many gardener's existence. 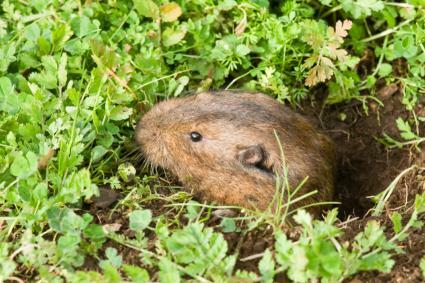 In an afternoon, a few gophers and moles can easily ruin weeks of hard work in the garden and they are notoriously difficult to deter. 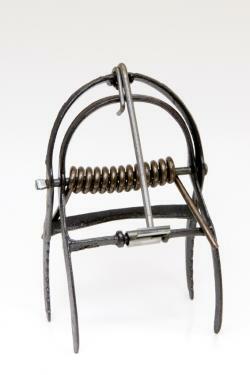 Trapping is generally considered the most effective way to control both gophers and moles. The key is to place the trap in a gopher or mole tunnel that is currently in use, which is indicated by freshly upturned earth. Excavate a small area of the tunnel, just big enough to place the trap and then lay a piece of wood, cardboard or any other object that will block the light over the exposed hole. There is no need to use bait, as the traps are designed to kill the animals as they traverse the tunnel. Different types of traps are used for moles and gophers, so be sure to get one that is designed for the animal in question. 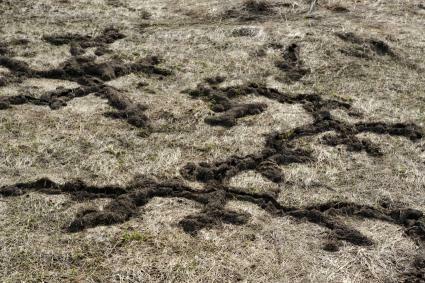 It is very easy to tell which critter is present by the appearance of the mounds that they create: gophers leave horseshoe-shaped mounds with no opening, while moles leave long ridges of earth pushed up slightly, typically with an opening at one end. Home Depot sells the Out-of-Sight mole trap; it is a scissor-jaw trap like the one pictured to the right, which is placed in a tunnel and is triggered by the mole as they scurry through. Be sure to follow the manufacturer's instructions for use. Hayneedle.com is a source for the famous Macabee gopher trap, which has earned a nearly cult-like reputation among farmers and gardener for its effectiveness. It's a bit tricky to set, however, but The Garden Counselor has provided a very detailed step-by-step guide for first-timers. Trapping is not for everyone, as it involves killing the animals and disposing of the bodies. Creating an underground barrier is the most popular alternative. It is easiest to do this during the installation of new landscaping, rather than retro-fitting existing plantings. Wire mesh is the material of choice for underground gopher and mole barriers. Hardware cloth with 1/2-inch holes is suitable for either animal. Chicken wire is a feasible option for gophers, but the holes in this material are large enough for moles to squeeze through. There is a also a product marketed as gopher wire that has slightly smaller holes than chicken wire and is made to last longer when in contact with the soil. 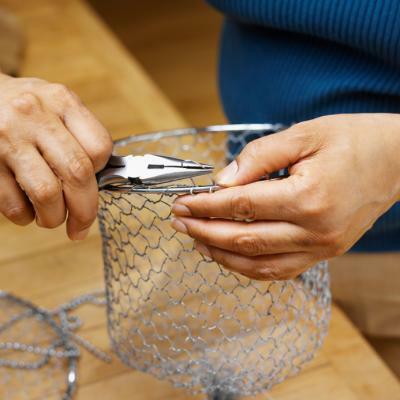 The root ball of individual plants can be enclosed in a cage of wire mesh at planting time. Pre-fabricated cages are commercially available, though they can also be constructed by cutting pieces from a roll of wire mesh and folding them into a basket shape, making sure that the seams are well-overlapped. The cage needs to be only slightly larger than the root ball that is being planted, though it should extend several inches above the soil line to prevent the animals from going up and over. Dig the hole, place the cage in it and place the root ball in the cage. Backfill soil around the cage and the roots just as if it was being planted normally. Individual flower or vegetable beds - or even entire lawn areas - can be protected with wire mesh to exclude gophers and moles. To be fully effective, the mesh needs to either line the entire area six to eight inches below the soil surface or extend at least two feet down in a vertical trench. In either case, the mesh needs to extend about six inches above the soil level. The best option is to use raised wooden beds and staple the mesh to the bottom of the beds when they are built, and then adding the soil on top. This precludes the need for the mesh to come above ground, as the sides of the bed prevents the animals from entering at ground level (they are extremely shy about being aboveground). Gopher poison typically consists of strychnine-laced grain. Moles typically eat bugs and grubs and require a different type of poison to be effective. Look for the products labeled for the animal in question. Again, it is important to place the poison in an active tunnel and then cover the opening to exclude light. Gopher and mole poisons are toxic to people and other animals, so they are not an appropriate solution in a yard where children and pets play. Follow the directions and safety precautions for poison products carefully. Solutions Pest and Lawn sells strychnine gopher poison in 1, 4 and 45 pound sizes, providing options for people with small yards or a large farms. Kaput Mole Gel Bait is sold at Amazon.com in a 3-ounce tube, and it's meant to be injected directly into the tunnel. This product contains warfarin, an anticoagulant, so keep it away from pets and children. There are various repellent substances on the market that claim to drive away gophers and moles. There is little scientific evidence to support their efficacy, with the exception of castor oil-based products, which, according to the University of California's Integrated Pest Management Program, have been shown to work effectively on moles in the eastern states. Of course, it may just mean that they are driven to another part of the yard or to a neighbors, which doesn't completely solve the problem. There are also devices that emit a high-pitched frequency underground as a repellent, but they are not considered an effective solution, either. Professional pest control companies have other products at their disposal that are not available to homeowners, such as underground explosives and poisonous gases - in cases of serious infestation, this may be the only truly effective measure. Often, a multi-prong approach is necessary to manage a garden in the presence of gophers and moles. Certain plantings may be more conducive to protecting with wire mesh, while baiting and trapping is carried out on a large scale to slowly reduce overall numbers. It is very difficult to achieve complete eradication by any one means, especially since new animals can always arrive from off-site. The good news is that, like all rodents, gopher and mole populations follow cyclical boom and bust cycles. It can be hard to have the patience, but during times of extreme damage from their underground activities, it gives some comfort to know that within a few years, the majority of the critters will disappear of their own accord.